Aquarium LED Lights, Controllers, RGB, Emitters; What is Best? These are three possibly four of the more questionable LEDs on the market if considered for a reef aquarium. Sadly many actually purchase these due than often less than honest marketing by companies such as Amazon or eBay thinking they might get a “top notch” Reef Compatible LED, which the TaoTronics/SunSpect might be reef compatible, but MOST CERTAINLY NOT top notch. Even your savings, since these are as little as $90 usd is of little good when the fixture goes belly up from moisture damage or is accidentally dropped in the aquarium since cheap Chinese made fixtures do not have an adequate water resistance/proof rating for an aquarium environment. Keep in mind that even the short warranty on these LEDs does not cover damage from water. It is also worthy of note that the reef compatibility comes at a higher cost in electricity used due to less efficient emitters, drivers, & especially controllers used, as per PUR NOT PAR despite many claims of PAR µMol readings while overlooking the VASTLY more important “Useful Energy”/PUR. As an example; basic science and math tells you that if you are using emitters that produce 20% more green and yellow spectrum light energy than another whose emitters produce 20% less, you are NOT going have the same PUR, which means a higher wattage, PAR rating, and higher carbon footprint will be required for the same results! Marketing claims include “replaces a 400 watt Metal Halide”. REALLY? I do not think so, maybe a 175 Metal Halide at best, especially when one considers how much wasted energy goes out as heat compared to better technology LED lights that utilize PWM, and more light energy is lost in less than optimum efficiency emitters and drivers. The Sky LED is not at all reef capable, only fish capable, although at least the Sky LED is not marketed for such either. The TaoTronic [AKA the SunSpect], which is unfortunately marketed as a high end reef capable LED light. While a few of the reviews might be good, lets look at the facts, if only from their own literature. Why? A well made LED fixture such as the ‘top notch’ AquaRay, or others should NOT require a cooling fan, only heat sinks. Half the cost in building a top notch Reef LED (or planted freshwater LED) is the circuitry/driver/controller that maintains important voltage over all emitters, otherwise issues of nanometer spikes, excess heat, etc. can arise and the fact this LED fixture requires a cooling fan speaks volumes. Again, VERY BASIC SCIENCE says that heat energy equals LOST ENERGY that will NOT go to light energy, so the fact these LED fixtures and so many others as well require a cooling fan again simply means a higher wattage LED fixture is required to do the job. Why do these require a cooling fan? Most LED fixtures, including the Taotronics utilize the very inefficient Current Reduction technology to run their LEDs rather than the more efficient PWM technology. “Current Reduction” produces much more excess heat, and also changes the light spectrum. This excess heat represents wasted energy that must be made in extra emitters to do the job of a much better designed LED fixture (such as the before mentioned AquaRay). In summary, the use of cooling fans is often a symptom of poor circuitry/drivers/controllers that produce excess heat. Please read further as to why the drivers/circuitry DO play a major role in the quality of light produced by an LED!! The next problem with all Taotronics lights is these are not water proof, in other words not a water proof design of IP67. So what this mean is your low cost LED, which is a light emitting electronic device is now being place in wet aquatic environment with a warranty of one year. What happens if it stops working in 15 months? Worse as in the case of a service customer that contacted me after they purchased one on Ebay, then they proceeded to accidentally drop one of the two fixtures they purchased in the water. The result, this light failed and the warranty would not cover the light even though just purchased two months earlier. “A fool and their money are soon parted”!!!! Why are so many emitters required??? This is similar to the shotgun approach to using early T12 fluorescent lights 25 years ago; why when there are excellent new generation Cree, Osram Olson, and Orphek powered LEDs available!! This is not to say the TaoTronics cannot work, rather why go with this energy wasteful older generation emitter technology when there are better LED Light Fixtures that use less energy, produce more PUR, and likely will last longer since the Taotronics only has 2/5 of the warranty (with better companies standing behind them too)?? As well, and thoughtful reader should note that the exact Kelvin, emitter bins, etc., are not cited. Even a simple Spectrograph has not been submitted by TaoTronics! This is for the reason that these daylight emitters are far from exacting. In fact I challenge any reader to go down to their local hardware store and purchase similar wattage “bright daylight” flashlight LEDs and produce the exact same results as these low end LED fixtures that essentially utilize cool white daylight emitters and less exacting older generation blue emitters. I also challenge those who would argue that utilizing a cool white emitter is OK for good results; WOULD you use a ‘Cool White’ T5, CFL, or Metal Halide Light over your Reef Aquarium? The answer in just a quick scan of the Internet of what others say is NO!! So why is it OK for an LED Fixture to use these emitters?? BTW, I am NOT saying adequate results might still be achieved with these LEDs and opportunistic specimen placement. One is simply achieving results in a shotgun type method with a lot of wasted energy!! Another aspect that many persons are not aware when it comes to exacting light energy produced by a well designed LED fixture is the drivers that keep voltage over each emitter to VERY exact voltages. One cannot “daisy chain” LED light emitters together like you can Christmas lights. This can only happen if these are daisy chained together. So again think twice if you are really getting a quality light with the Sunspect or Taotronics, as again all you are getting is cheap Chinese cr## that might work for a while, but not very long. Each individual emitter can change the voltage to other emitters, if only by fractions, however with an LED emitter designed to produce exacting light energy, this can make a big difference light spectral quality. LEDs are not typical lights such as a CFL, these are essentially electronic devices that emit light!!! As well, the FACTS are Pulse width modulation (PWM) is required to maintain spectral quality and the TaoTronics DOES NOT utilize this expensive technology, rather the much less expensive current reduction reduction method as noted earlier! The bottom line is; the more emitters, the more complex and expensive the drivers, so when you have a fixture such as this TaoTronics LED with a shotgun approach of emitters yet with essentially no adequate drivers, you are essentially stringing hardware store LED flashlights together over your aquarium. There is no way one can have an LED fixture for the price of the TaoTronics with complex drivers any more than a $300 Laptop is going to have Intel’s best computer processor. Of course the answer is simple with these cheap Chinese Drivers. 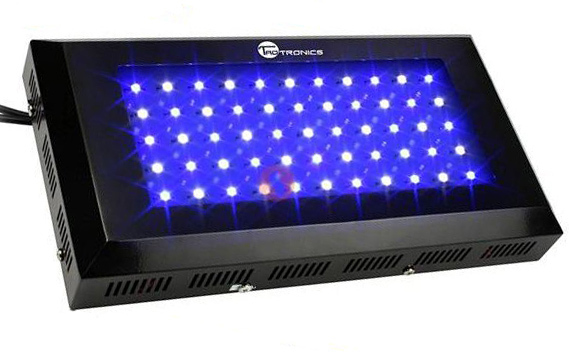 Another TaoTronics LED, the “TaoTronics LED Aquarium Coral Reef Tank Blue White 2:1 LED” uses too many blue emitters for the average depth aquarium these are used for, thus lacking adequate Photosynthetic response. Also check our the many references cited by the above quoted article for those who want to continue to believe non scientific observations. The above reference has the Spectrogram published by Blue Moon showing vastly more blue than is best for an average reef tank. This LED is made in the EXACT same factory in China (which builds these LEDs for distribution under any company willing to purchase and place their name on the product). Between the older generation emitters (especially with the “TaoTronics Aquarium Coral Reef Tank White/Blue LED Lamp 120 Watt”), low quality drivers & controllers, shotgun approach to lighting, poor PUR is going to be the result! The other perplexing question is why anyone would spend close to $200 for this LED when for $300 or less, one could have a 100% new generation reef capable LED that uses much less electricity in the AquaRay 2000 or 1500 Ultima, or even the lesser but still capable AI Sol, or EcoTech LEDs?? What is so absurd is the persons who might brag how they have kept reef life with their Taotronics Aquarium LED and have spent less money up front. But are these persons saving money? NO, not when it takes 2.25 to 3 watts per gallon for a Taotronics to achieve the same results as an AquaRay 2000 NP Ultima at only .8 watt per gallon. THIS IS TRIPLE THE WATTAGE! This defeats the purpose of purchasing an LED Aquarium Light in the first place, to save on electricity and lower heat produced by Metal Halide lights. As an example of this absurdity; you are going to replace your (2) 150 watt Metal Halide fixtures on a 75 gallon reef aquarium, only to purchase (2) 120 watt Taotronics. You have only saved a total of 60 watts to questionably do the same job?? While you could have purchase (2) AquaRay Ocean Blue 1500s at 30 watts each (60 watts total) to do this same job of lighting a 75 gallon reef aquarium. Not to mention the reliability of these Taotronic LEDs and their cooling fans that have been reported to actually catch on fire, and one has to wonder about the logic that goes into purchasing the Taotronics LED just to save a few dollars up front????? The Warranty is only two years, limited too (repairs), compared to 5 year for the industry leading AquaRay at 5 years (full replacement). Finally on a related note, as person who has a lot of time and experience invested in the aquarium hobby, I hear and see much of what my clients have purchased or have been told. One common thread is the junk often sold via Amazon or the terribly inaccurate Amazon social media driven reviews which often have absolutely no bases in fact, often due to incomplete sales of many products for proper function (to keep the price low) such as the Rena Smart Filter. The Taotronics LEDs are a further example of why Amazon is not the place to purchase or get accurate aquarium supply information. The SkyLED along with the Marine Skkye is another vastly inferior LED, however at least it is not generally marketed as anything more than a large decorative LED Fish only aquarium light. The popular SkyLED 36 inch model has (378) bright white, blue, and red LEDs; none of which are from exacting LED emitter bins. At 23 watts and 378 emitters, this comes to only .06 watt per low PUR output emitter, making this a decorative light only. This said, as a pricey replacement for two 30 watt fluorescent lights over a fish only tank, this LED will certainly use less electricity than two or even one fluorescent light PLUS add a nice sheen and color your fluorescent lights cannot achieve. I will also note that I have used this light for demonstration, and can vouch for the nice decorative only features. So in summary for the Sky LED, it may be a worthwhile purchase under the correct criteria with probably my biggest complaint not with the light itself (again under correct use), but with those selling this light. The Marine Skkye is another Chinese knock off using inferior low cost emitters, drivers, and controllers, sometimes marketed as a Reef Capable light.